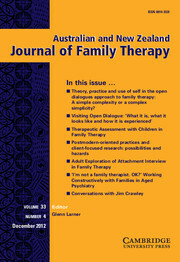 Australian and New Zealand Journal of Family Therapy (ANZJFT), represents not only family therapy, but any clinical approaches that can broadly be described as 'innovative' or 'contextual'. The Journal publishes important research and theory as well as short, reader-friendly papers of direct relevance to anyone working in family-sensitive practice. It is governed by therapists, for therapists.